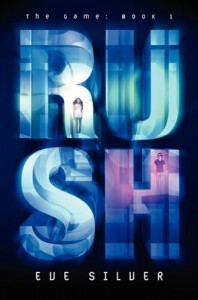 Rush is a read that I have a hard time putting my finger on, or even really wrapping my brain around. It all basically starts with a car accident and a game that is really not a game. Miki is a normal high school student until one day when for the greater good, she sacrifices herself for a younger student. From the moment of that sacrifice, Miki is pulled into what the others refer to as the game. A life or death battle against some crazy creatures.From early on in the read, Rush felt all over the place. Sometimes in a good way. Most of the time, not so much. I knew the basic concept prior to reading Rush, so I thought I knew what I was getting into. But Rush was one of those reads where the summary was a bit misleading. For me, the most confusing element was the why. Later on in Rush, a lot of questions get answers, which is great. But some of the answers left like they should have been earlier in the read to make it flow better. Additionally, I am not quite sure I ever understood how / why these kids got pulled in the first place. If the event causing the pull never happened, would have they have been pulled in the first place? As for our romance, I will just say, it took time to grow on me. Miki was a great character. I adored Luka. And Jackson… was Jackson. Part of me wants to say I liked him. Part of me wants to say he was too much. The constant, 'I am not a good guy' or 'You shouldn't trust me.' stuff over and over and over again really was a bit overdone. Final Verdict:Rush took a while for me to warm up to it. Am I in love with this book? No, not really. But by the end, I was sold on the concept, the characters, and wanted to know more about everything. Especially after the crazy cliffhanger.Will I read the next installment?Probably. There are a lot of questions that I still need answers to. And I gotta find out what happens next. But the series is on a bit of shaky ground with me, so only time will tell how I feel about the series overall.